Hello fellow WoW nerds! Welcome to Find Aeonaxx, the guide where I will do my best to supply you with as much information as possible to help you find and down Aeonaxx. 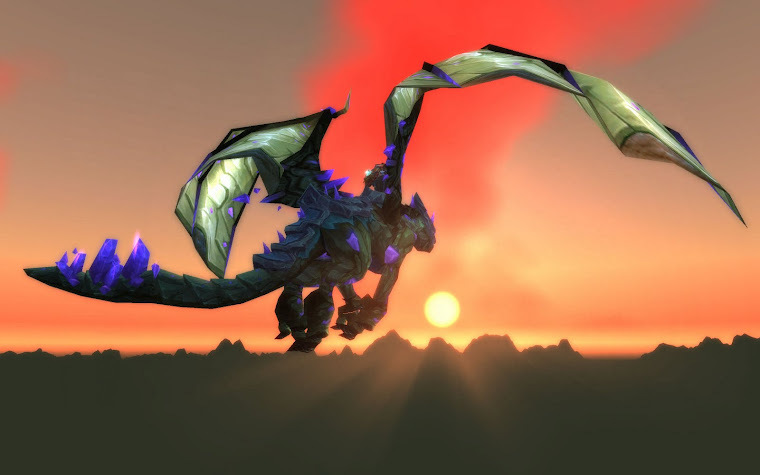 Aeonaxx is the rare spawn in Deepholm who drops Reins of the Phosphorescent Stone Drake. NPC scan is an absolute necessity if you plan on finding Aeonaxx. You can download it from Curse.com. I also highly recommend downloading NPCScan.Overlay as well. (NPCScan.Overlay adds an overlay to your map which displays where rare mobs patrol.) What NPCScan does is track rarely seen mobs in the game by proximity. When a rare npc is found npcscan checks your creature cache and the mob becomes "cached". It is extremely important that you clear your cache often. Npcscan will NOT be able to find a cached npc again until your cache has been cleared. Although kind of annoying, clearing your cache is relatively simple. 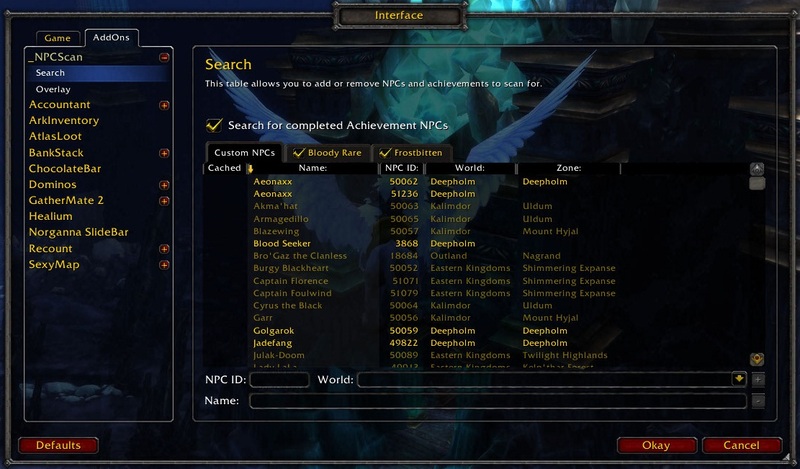 Delete the “Cache” sub-directory inside your World of Warcraft folder. For example on a standard Windows XP installation, you would delete the folder “C:\Program Files\World of Warcraft\Cache”. Advanced users can delete “C:\Program Files\World of Warcraft\Cache\WDB\enUS\creaturecache.wdb” specifically to improve log-in times, where enUS is your language code. When npcscan finds a rare spawn it will alert you with a loud sound. (I prefer to keep mine on the default setting.) Your screen will also pulse red and an animated button will appear displaying the name of the rare spawn and a small picture of it. When you click on the animated button npcscan will attempt targeting the rare spawn. I made a short fraps video testing the found alert below. When you download npcscan it will have one npc ID for Aeonaxx, which is 50062. The ID 50062 is the one for Aeonaxx when he is still friendly before being mounted. Once mounted Aeonaxx's ID will change to 51236. Make sure you add this ID under the Custom NPCs tab. Put in the number 51236, world is optional (I put "Deepholm" in mine) and in the name field you can put in Aeonaxx. Be sure to hit the little + sign to add it to the list. Another ID you are probably going to want to add is 3868. This ID is for Blood Seeker. 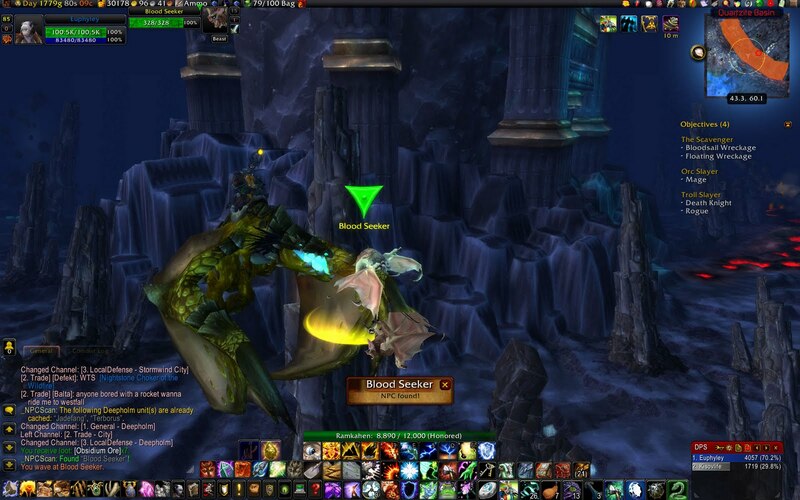 Blood Seeker is a non-elite level 15 bat that torments us by sharing a spawn point with Aeonaxx. Blood Seeker spawns exactly where Aeonaxx spawns. If your npcscan goes off, and it's Blood Seeker that you've found you can be sure that Aeonaxx won't be spawning again for several hours. 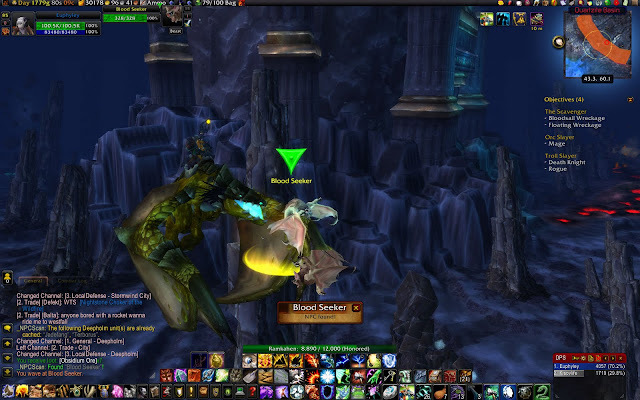 Here is a screenshot below of the pesky Blood Seeker in the Quartzite Basin Aeonaxx spawn location. Make sure you have your view distance set to "ULTRA" when you are camping for Aeonaxx. If your video card can draw Aeonaxx your NPCScan will go off. If your settings are too low you may not see him if he spawns. When you're ready to begin the hunt for Aeonaxx your Npcscan should look just like the one in the screenshot below. Note how all three NPC IDs are included: 50062, 51236 and 3868. Also notice how there are no red x's under the cached column. Remember, DON'T FORGET TO CLEAR YOUR CACHE!! If Aeonaxx spawns and has been cached npcscan will not go off. I saw you were going to post something relating to rare spawn hunting? I am planning on recording myself killing as many of the rare spawns in Cata and uploading them all to youtube! Thanks for the kind words Ben. =) Finding rare spawns has always been one of my favorite things to do in game. 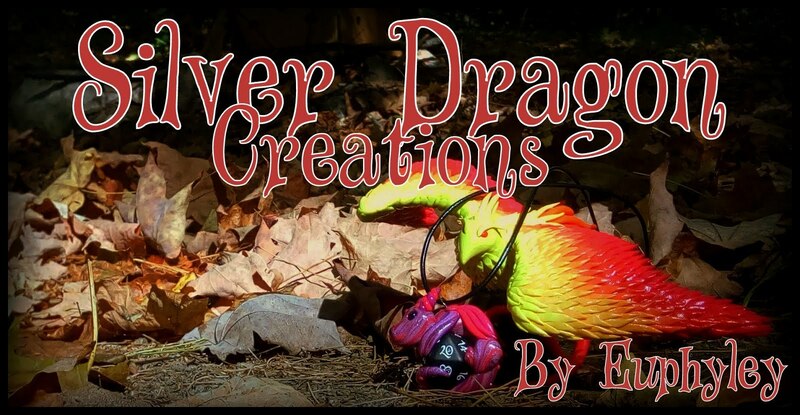 I do plan on doing another guide on a separate blog relating to all rare spawns from BC, wotlk and cata. Before I get too into that one though I plan on fine tuning this one first. Turn on "unmute for alert sound" in npcscan options and you'll be able to hear the alert while in background. "IF YOU TAB OUT OF THE GAME YOU WILL NOT BE ABLE TO HEAR NPCSCAN IF IT GOES OFF" If you do not have Background sound enabled. might want to correct that. What I said about tabbing out was not incorrect, although maybe I should have worded that differently. If you do not have background sound enabled you will not be able to hear any sound from the game at all when you are tabbed out....period. When it is enabled you will be able to hear game sounds, MINUS NPCScan if it goes off. I know this from first hand experience. When I missed Aeonaxx once because I was tabbed out of the game searching the internet I could hear all of the lovely ambient sounds of Deepholm. When I tabbed back in I instantly heard the NPCScan alert, but it was too late, someone else had snagged him. Also, regarding the post above talking about "unmute for alert sound". I generally have this checked off when I camp so that I can turn up my volume incredibly loud to be able to hear NPCScan across the house if it were to go off. Having "unmute for alert" checked off in NPCScan enables you to disable your game sound completely but if a rare is spotted you will be able to hear the NPCScan alert sound. As far as tabbing out of the game and still hearing it, I highly doubt having it checked off will allow you to hear the alert, unless of course your personal experience says otherwise. I'm pretty sure the main reason for "unmute for alert sound" is that most long-term campers get tired of hearing the looping game sounds for days on end. It's nice not to hear the game sound at all and then hear that massive incredibly loud fog horn type alert when a rare does show up. What if you set Display mode to Windowed(fullscreen)? Can u hear npc scan go off then? Can someone please let me know how to add another NPC like the Bat? I dont see a "+" button anywhere, thanks. I've heard a lot of mixed responses as far as having wow in windowed mode. I can't speak from personal experience here either as I generally don't play in windowed mode. Adding an NPC: To add blood seeker where it says NPC ID type in 3868, then where it says name type in "Blood Seeker". After those two things are typed in to add the npc you need to hit the "+" button located all the way on the right next to the dropdown arrow for the world section. Once those two sections are filled in the "+" should got from being greyed out to red. This appears to have some false information, not sure why the sounds arn't working for the above poster but background sounds DO work and this includes NPC scan and other addons. I figured out your problem. You will not hear sounds if its "Minimized" if its a window and not minimized it will work with sounds. I have found that adding the option to place a raid marker on the head of the spawn helps to find it when the sound goes off.